(ā`trēəm), term for an interior court in Roman domestic architecture and also for a type of entrance court in early Christian churches. The Roman atrium was an unroofed or partially roofed area with rooms opening from it. In early times its center held a cooking hearth. After the 2d cent. B.C., when the hearth was placed elsewhere, the center of the atrium held a tank (impluvium) to receive rainwater falling through the opening, which also furnished light to the surrounding rooms. 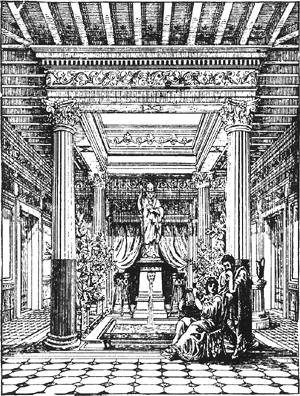 In more luxurious and complex Roman dwellings, the private apartments had a court of their own, called the peristyle, and the atrium served merely as a semipublic reception hall. The ruins of Pompeii contain remains of atria in their various forms. In early Christian churches, the atrium was a large arcaded or colonnaded open court, serving as a general meeting place, in front of the church itself, with a fountain used for ablutions in its center. The basilican churches of Sant'Ambrogio in Milan and San Clemente in Rome have noteworthy atria. This type of large forecourt is also a characteristic element of the Muslim mosque. The term also refers to a modern building's central court, an often soaring interior space with a large skylight. Creating a flood of natural light and usually filled with plants, the feature has become practically ubiquitous in contemporary architecture; it is used predominantly in commercial buildings. The forecourt of an early Christian basilica, with colonnades on all four sides, and usually a fountain in the center. It was derived from the entrance court or hall of a Roman dwelling, roofed to leave a large opening to admit light. Rain was received in a cistern below. The modern version is a common vertical space with skylights in an office or hotel complex. The heart chamber that receives blood from the veins. The main part of the tympanic cavity, below the malleus. The external chamber to receive water from the gills in lancelets and tunicates. An open court located within a building. Excess weight explained most of the increased risk with atrial fibrillation, said study author Dr. Appropriate anticoagulant therapy substantially reduces the risk of stroke, but in many cases non-valvular atrial fibrillation is only diagnosed after a patient has had a stroke, he continued. The aims of this study were (1) to identify early changes in atrial electromechanical conduction among hypertensive patients using TDI, (2) to assess the parameters that affect atrial electromechanical conduction. But you should also be aware of a similar condition, called atrial flutter. There is well known risk of thromboembolic phenomenon in patients with atrial fibrillation (AF), mostly from a thrombus arising from the left atrial appendage (LAA)1-4. Atrial fibrillation commonly occurs with rheumatic heart disease, particularly mitral stenosis. Patients with MAT also tend to have bouts of other arrhythmias,2 and 3 months earlier this patient had atrial flutter with 2:1 atrioventricular conduction. In this group of patients, the left atrial appendage was on average 67% larger than in the healthy control group. Paroxysmal atrial fibrillation (PAF), as opposed to permanent AF, is transient, infrequent, and often asymptomatic. The physical examination findings were unremarkable except those patients with atrial fibrillation. Prolongation of maximum P-wave duration and increased P dispersion are thought to be indicators of interatrial conduction disturbance and are often used to predict paroxysmal atrial fibrillation (9, 10). These device-detected asymptomatic episodes of atrial tachyarrhythmia are quite common in pacemaker recipients who have no history of atrial fibrillation.